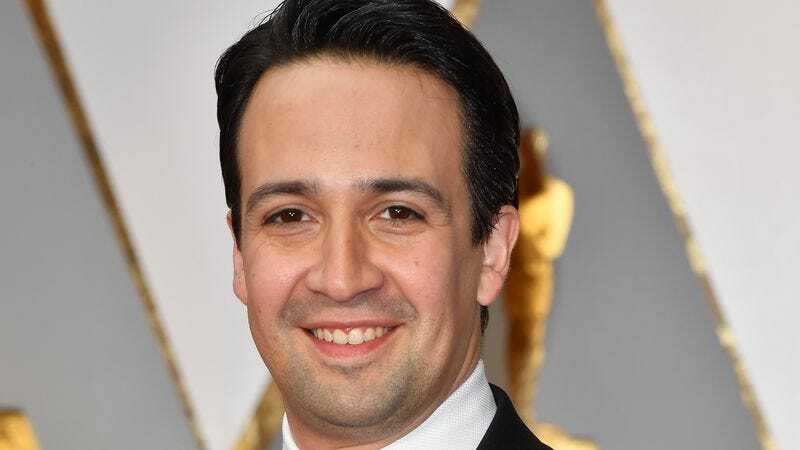 Karaoke king Lin-Manuel Miranda will perform tonight at the Oscars—where he could end up getting the last trophy in his potential EGOT—but he began his evening by being serenaded. Ryan Seacrest surprised the actor/composer during his red carpet interview with a video of the Broadway cast of Hamilton performing a mash-up of a number of his tunes. The focal point of the medley was the nominated “How Far I’ll Go” from Moana, however, the group also weaved in snippets of Hamilton’s “My Shot” and “The Schuyler Sisters,” and the Disney movie’s ”You’re Welcome.” At the very end, Taran Killam—currently playing King George III—made a brief cameo. Miranda was, for lack of a better word, verklempt after watching.